There’s such a lot of mis-information out there about public sector pensions, that we thought a myth busting guide to pensions might be useful for members and the public. MYTH – People are living longer which means they’re claiming their pensions for longer – this needs to be addressed. The public sector pension schemes were revised to take account of this three years ago – so scheme benefits and costs are now 25% lower. In addition, life expectancy has increased, but less so for manual workers and the low paid. MYTH – There’s a big public sector pensions deficit that has to be repaid. There is no funding gap – the public sector schemes were assessed for long term risk and adjusted accordingly three years ago and are now very secure. Both the local government pension scheme and NHS pension scheme are currently cash rich with income far exceeding outgoings – some £2 billion in the case of the NHS pension scheme. MYTH – Public services and public service pensions caused the financial crisis. It was the banking sector’s reckless risk taking and excessive greed that caused this global recession. MYTH – We’re all in it together. 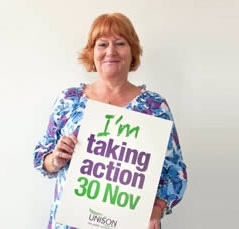 Everyone has to make sacrifices right now – why not public sector workers? Pulbic sector workers are already making big sacrifices. We are all facing cuts to our public services – on top of this public service workers are facing unprecedented job cuts and a pay freeze. We will all end up paying more tax if people drop out of the scheme to end up relying on the state in their old age. MYTH – It’s not fair, why should the public sector get good pensions when the private sector doesn’t? The average director of a FTSE 100 company has a final salary pension worth £3.6m or £174,963 a year, while the average occupational pension generally is £9,500 a year and the average public service pension is £7,800 a year. That’s the real unfairness. UNISON thinks everyone deserves an adequate pension, including workers in the private sector. We should improve bad schemes rather than make good ones bad. Providing adequate pensions means that fewer people will be receiving welfare handouts after retirement, which would cost the taxpayer more money in the long run. MYTH – Public sector workers have it too good with huge pensions. The average public service pension is around £7,800 a year, for women working in local government the average is £2,800 a year, while the median for women working in the NHS is £3,500 a year: these are not huge pensions. Saving towards an occupational pension in many cases means a person is receiving fewer welfare benefits during retirement, saving the taxpayer money. MYTH – Taxpayers are paying for public service workers’ pensions. That’s not fair. Everyone’s taxes are used to pay for all public services – stethoscopes in hospitals, the salaries of primary school teachers, people to change the light bulbs in street lamps, and part of these people’s pay is their pension. A pension is part of someone’s salary package and is no different than an annual salary, a car, or the London weighting allowance. It’s not fair to change something in a job contract after someone accepted the job. One in five people working in the UK works in public services. They are taxpayers too. MYTH – Public service workers retire at 60. The normal retirement age in many of the public service pension schemes is already 65. Raising the retirement age hurts some people more than others. In general we’re living longer, but that doesn’t mean everyone will have the same quality of life. continue working into old age. Similarly many low paid workers simply don’t have the option of retiring early because they can’t afford it.